News about HyTest | Hytest Ltd.
We invited Prof. David Eckersall to give a talk in VMX 2019 about the usefulness of canine CRP and other acute phase proteins in veterinary diagnostics. We are delighted to let you know that we are sponsoring the 4th Cardiac Marker Dialogues meeting in April. We will attend the 16th China Association of Clinical Laboratory Practice Expo held at Nanchang Greenland International Expo Center, on 22-24 March. We would like to wish you immense happiness during this holiday season and throughout the coming year. We have included three new anti-CPV antibodies to our offering. These new MAbs work well in different pair combinations demonstrating high sensitivity in sandwich immunoassays. We will be present at the VMX: Veterinary Meeting & Expo, Orlando during January 19-23. Serum amyloid A is used as an inflammatory marker in different animals. In cats, it is the only biomarker that shows a rapid and significant response to inflammation. We are delighted to let you know that we are sponsoring the EFLM-HyTest Cardiac Marker Award for remarkable scientific work in the field of cardiovascular diseases. If you or your colleagues will attend the MEDICA 2018 - the World's Leading Medical Forum - from November 12 to 15, in Düsseldorf, Germany, please schedule a meeting with us. Summa Equity will become majority shareholder of the Finnish company HyTest, producer of antibodies and antigens for the diagnostic industry. During the first half of the year, HyTest’s consolidated revenue grew to 14.4 million euros. Watch our presentation of this biomarker to learn more. We will be participating the 2018 AACC Annual Meeting & Clinical Lab Expo. The exhibition will be on July 31 - August 2 in Chicago. Are you familiar with all of our different clinical areas? Or were you already aware of how many products we are able to manufacture and ship to our customers every year? In high-sensitivity troponin assays, the specificity of the antibodies utilized is of utmost importance. As the clinically relevant concentration of cardiac troponin T is just nanograms per litre, even a minor cross-reactivity of the assay to skeletal troponin T isoforms could result in false positives. During the last fiscal year HyTest’s consolidated revenue was 24.1 million euros, which equated to a year-on-year growth of 1.3%. This rate was low due to the exceptionally strong growth experienced in 2016. 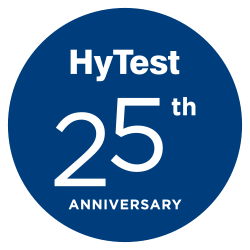 24.04.2018 Articles from HyTest Scientists - Receive a Free Copy!